So my blueberry bushes have been growing more blueberries than I thought four bushes could grow. Granted I have never seen a giant blueberry bush before, but still… In our last harvest they were looking a little peaked so I had to use them quickly. I added some to pancakes, made these delicious vegan blueberry muffins, and froze the rest for future deliciousness. You could really use any fruit in this recipe, I have used strawberries in the past and loved them. A very good impressive vegan muffin. You could never tell they are vegan. Preheat your oven to 375 degrees and grease muffin tins. Gently stir in milk, oil, and vanilla but be careful not to over-mix. A few lumps are okay! Fold in your thawed blueberries. 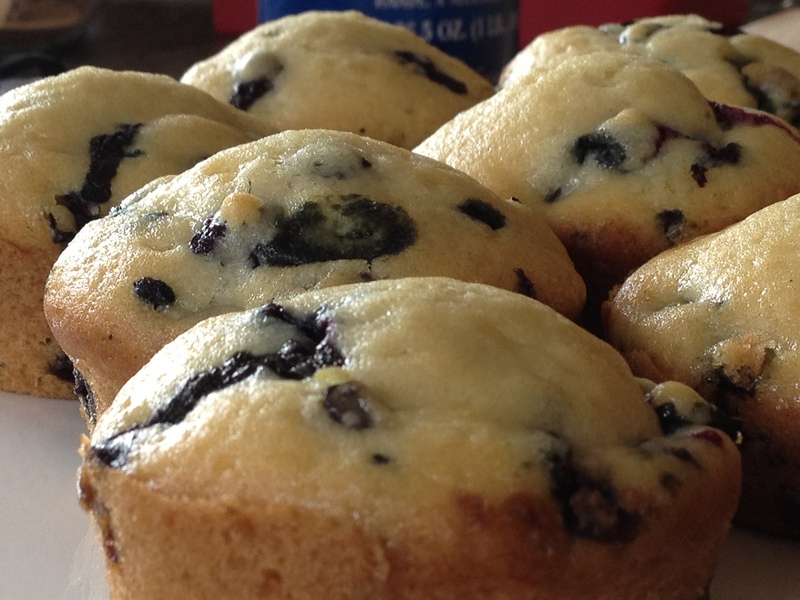 Pour batter into muffin tins, ¾ of the way to the top. Slide your filled tins into the oven and cook for 15 – 20 minutes until golden brown on top and a toothpick inserted in the center of a muffin comes out clean. Fresh out of the oven they are still young and impressionable, so don’t try to remove them immediately or you will end up with smushed, dented muffins! Allow to sit for at least 10 minutes inside their cooking vessel. Enjoy with someone you love. Have you ever been sitting around and wishing for a sophisticated cookie that you could serve to guests over tea? Or perhaps one to impress the foodie in your life? If you answered yes then these cookies should do the trick. I made them over the holidays and my brother and I kept eating them and saying “that is a sophisticated cookie.” They are also good, don’t worry about that. It is just when you are describing them you aren’t talking about a regular old chocolate chip cookie, or a cookie that is going to make your inner fat kid jump for joy. No, these are a surprising cookie, they make people take notice. To add to the cookie goodness these are dipped in chocolate and sprinkled with lavender salt. If you have extra lavender salt I highly recommend sprinkling just a bit on your hot chocolate next time you make it. Anyway, on to the cookies my friends. Place Earth Balance, brown sugar, salt, 1/2 tsp. lavender, and cocoa nibs in mixing bowl. Slice vanilla bean lengthwise and scrape seeds from the pod. Add vanilla seeds to the mixing bowl and cream everything until smooth. Once mixture is smooth add flour and mix thoroughly until dough starts to stick together. Turn dough out onto a large piece of wax paper. Pat dough into a log about 2 inches wide and 1/2 inch thick with flat sides. Wrap log in wax paper, then in plastic wrap. Let the dough chill in the refrigerator for at least one hour. Once chilled remove log from wax paper and slice into thin cookies about and 1/8 inch thick. Place cookies on an ungreased cookie sheet and bake 10-12 minutes until golden brown. Mix 1 tsp coarse sea salt and 1/8 tsp lavender together. Set aside. Melt chocolate chips either in the microwave or over a double boiler. Once chocolate is melted and cookies are mostly cool dip half of one side of the cookies into the chocolate and place on a large sheet of wax paper. You just want a little dip of chocolate on the end of the cookie. Be careful to use only a little chocolate per cookie, scraping the cookie lightly against the side of the bowl to take of the extra chocolate. These cookies are very delicate tasting and you don’t want to overwhelm them with the chocolate. 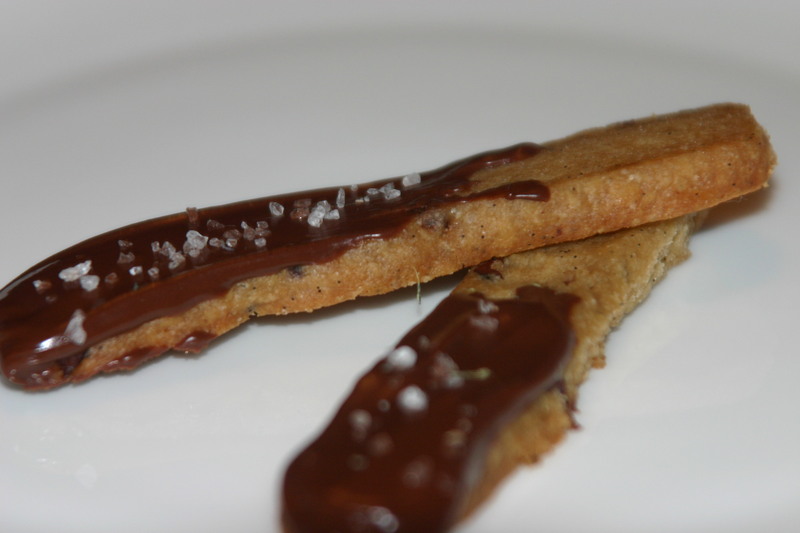 Once cookies have been dipped in chocolate sprinkle the lavender sea salt over the chocolate.